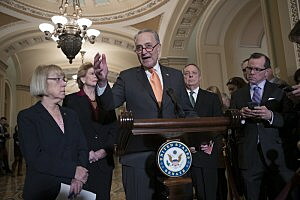 WASHINGTON (CN) – With the president backing down on his demand for a $5 billion carveout in the budget for his border wall, Senate Democrats joined Republicans Wednesday to approve a short-term funding bill that will keep the government running until mid-February. Earlier in the morning, Senate Majority Leader Mitch McConnell touted his bill as the result of “good-faith efforts” from his party and the White House, while blaming Democrats for creating the budgetary impasse. “I’m sorry that my Democratic colleagues couldn’t put partisanship aside and show the same good-faith flexibility that the president has shown in order to provide the resources our nation needs to secure the integrity of our borders and the safety of American families,” McConnell said. Schumer had refused McConnell’s last proposal on Tuesday after complaining that the bill contained a $1 billion “slush fund” for President Donald Trump’s immigration policies. After a phone call with House Minority Leader Nancy Pelosi, Schumer said Tuesday that Democrats would “seriously consider” a stop-gap should the Republicans put one on the table. McConnell’s bill will keep paychecks in government employee’s hands through the New Year, but the battle on border-wall funding is expected to resume once Congress comes back to session in January, this time with Democrats in control of the House. Echoing his words from Tuesday’s press conference, Schumer warned Trump on Wednesday that Congress will staunchly oppose his efforts to have U.S. taxpayers fund the wall. Though the Senate passed the bill, it is still possible Trump will choose not to sign off. White House counselor Kellyanne Conway told reporters Wednesday morning that the president will take a look at the offer from Congress. If a partial shutdown were to happen, hundreds of thousands of federal employees deemed “essential,” like airport security agents and the Secret Service, would continue to work without timely pay until the shutdown ends. Thousands more would face unpaid furloughs.